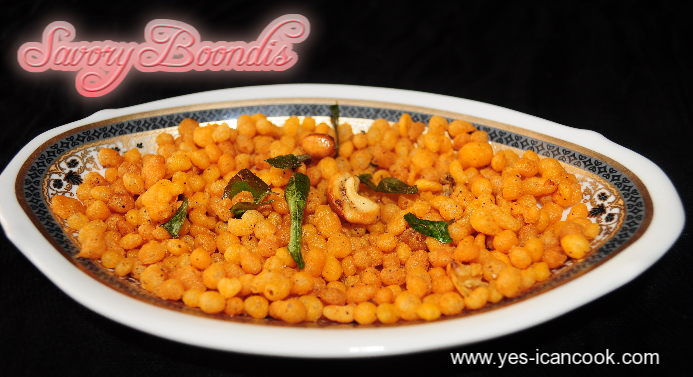 Crunchy, Munchy, Tasty Savory Boondis. Till the time I made them I believed they were meant to be store bought only. I was not too confident on the outcome while preparing it but now I would encourage everyone to give this a try if you like savory boondis. With very basic ingredients this is an excellent snack. It can be stored in airtight containers for several days at room temperature. 1. Sieve gram flour, rice flour, salt and soda powder to a mixing bowl. 2. Add water and mix without any lumps to first make a smooth thick paste. 3. Add water little by little and mix to achieve bajji batter consistency. 5. Keep 2 slotted spoons ready, one for making boondis and the other to remove boondis. Also keep a ladle ready for pouring the batter. 6. Take a ladle of batter. Keep a slotted spoon a little above the vessel with hot oil. Pour the batter on the slotted spoon and spread it with the ladle. The batter will fall into the oil as small pearls. Reduce flame to medium and Fry them till they turn golden and remove on to absorbent paper. 7. If the boondi pearls have tails then the batter is thick and you need to add a little water. 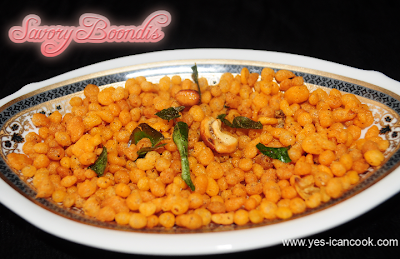 If the boondis fall flat then the batter is thin, add some gram flour and mix without lumps. Drop the batter in hot oil or else the boondis will simply stick together and form a disc. Reduce flame after the boondis drop and start cooking. 8. Fry boondis with all the batter. Transfer the fried boondis to a bowl. 9. Heat ghee in a saucepan. 10. Break cashew into pieces and fry it in the ghee till they turn golden. Add peanuts if using and fry them too. 11. Tear curry leaves and add to the saucepan and fry for half a minute. 12. Add 1 teaspoon or less of pepper powder and mix well. 13. Add this to the boondis and mix well. 14. Sprinkle some salt and the remaining pepper powder and mix.